Hi folks, The new Deepstar Kraken model is coming out soon for DeepWars and I painted up this one for display using a lot of inks and liquid acrylics. This model (not really a miniature when this big) was done in different stages. The base painting was done with blue skin and light tentacles. The mantle and top of the tentacles were given two washes of Marine Blue (Ultramarine) liquid acrylics (Dr. Phil Martins brand) mixed with matte medium and water. When the first was dry, the second was applied. The underside of the tentacles was done with a mix of Cerulean Blue ink (Liquitex) + white paint + Matte medium and water. After removing from the base, as it was making it difficult to reach the bottom of the tentacles, I applied many light blue glazes (Cerulean Blue + Ultramarine Blue + White) for highlights and some dark (Ultramarine Blue) glazes for shadows. The goal was to make the blending mostly smooth but not to go overboard and spend too long on it. The reason will become clear soon. The next stage was the big one. Dots of blue-green, green, yellow-green, white and various shades of orange and Burnt Umber were applied to the mantle and tentacles. This was done using Liquitex inks and Phil Martin liquid acrylics to make sure the dots were very pure in color and, more importantly, flowed evenly off the end of the brush, which was held and used like a pen. After the dots had dried, glazes of inks colors were applied, yellow-green to the mantle and tips of tentacles and bright orange to the “face”. When this dried, more dots were applied over them and highlights were applied to some of the dots using a bit of white or yellow mixed into the ink. The eyes were done with yellow liquid acrylic mixed with white, black, and a bit of blue as the base. It was highlighted with more white and a touch of yellow. The black iris was painted, then more white highlights were applied around it to clean it up. Finally, the big highlight was added at the top with thinned white. The eyes were not painted as gems (bright bottom, dark top with hot-spot secular reflection) here as the light was meant to be diffused by the water. Maybe next time. The base was done with washes of Burnt Sienna ink first, then washes of Pthalho blue and Marine Blue ink to darken the rocks. it was all drybrushed with Americana brand Buttermilk, then some glazes of greens, magentas and purples were added to the sponges and corals. The barnacles were drybrushed with some white to make them stand out. 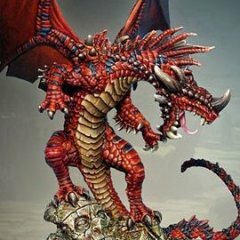 Tips for painting larger "minis"
You may want to consider using washes and glazes of inks to bring out textures, like scales. 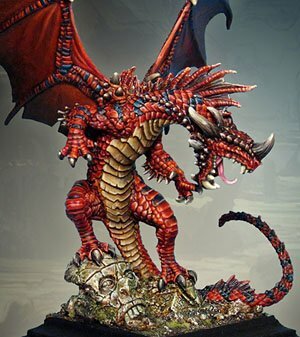 Smooth surfaces like wings still require blending but many large creatures with textured surfaces can be done really efficiently with washes and glazes. Here is an old example a dragon done this way. Hi folks, Here is my painted version of the Sea Hag, Ol’ Ginny Greenteeth for the Nereids of Blood Reef, for DeepWars. It's a pre-production model as the final one is coming out later. She was done with a lot of washes and glazes over a “zenith-primed” base. Most of you already know how this is done, with a base coat of black primer all over, then white primer sprayed from above to simulate how light falls on the model. The skin was started with Phthalo Green ink + black paint + Matte medium. The clothing was started first with an olive hue, made with an Ivy green paint mixed with Burnt Umber and Burnt Sienna ink. The skin was highlighted with the green ink + a light golden white (Buttermilk color – Americana brand) and white. This clothing was highlighted with addition of the golden white paint. Kelp was painted with additional Ivy green and highlighted with a touch of yellow and buttermilk. Shells were glazed with golden white and then glazed with Burnt Sienna ink before getting edge highlights with pure white. Her hair was done with a “Sea Foam” color, which was Phthalo green and a touch of Phthalo blue ink and white paint for the base, then highlighted with white. The base was done with a light glaze of Burnt Sienna ink over the rocks, then let dry, while the spiky coral was painted with Deep Violet ink. When all dry, the rock was washed with Phthalo blue ink. The crab was painted with a light glaze of Burnt Sienna ink, then Pthahlo blue on the back shell and highlighted with thinned white. The worms were painted with a blue-purple gray, highlighted with white. Hi folks, A couple more here, done with washes and glazes. These were given a zenith prime with black all over before white from above. What we have here are two new models for DeepWars, the Vanguard Scout and the Ethereal Thotag Crab. The Vanguard Scout armor was first given a base wash of Burnt Sienna ink while the weapon, respirator and scale armor were done in bright gold. Skin, tentacles and the crystal warheads were painted with Cerulean blue ink. The cloth on the back was given a light wash of Ivy Green paint. For the crab, the carapace was washed with a mixture of Turquoise ink and white paint on the top and golden yellow and white paint on the underside, having them overlap a bit a the middle and on the face. The Chelae were painted with the Turquoise/white mix with a bit of Phthalo blue ink mixed in. Next, the scout was washed with 50% Phthalo blue ink mixed with a bit of black paint and 50% Liquitex matte medium. This glopped on and got into all of the cracks and tinted the shade down a lot, though leaving an orange hue to the armor. The metal parts were washed with 50% Burnt Umber / 50% matte medium while the cloth was washed with a mix of 50% medium and 50% Dioxazine purple ink mixed with a a bit of Sap Green ink. when it was all dry, the armor plates were glazed with Burnt Sienna ink and the edges of the armor plates and barnacles were then painted with an golden white (Americana brand Buttermilk). The biofouling growth on the armor was given a light glaze of Sap Green ink after highlighting with golden white. After the armor was highlighted. The metal parts were highlighted with bright gold and silver, with some gems done with Phthalo green + a bit of yellow, given the classic "gem" treatment with shadows and hotspot highlights. The skin on the feet was highlighted with thinned white mixed with Cerulean blue, adding a few lines for texture. The crystal warheads were washed with Turquoise ink first to shade them, then highlighted with white and shaded a bit on some of the facets with thinned black. The cloth was highlighted with Ivy Green paint mixed with golden white, adding a bit of crosshatch texture here and there with very thin lines. Tentacles peek out from under the armor here and there and they were shaded with 50/50 Phthalo blue ink + medium, with the tips glazed with magenta ink. Highlights were applied with thinned white paint by making small lines across the tentacles and a single line along the bottom on each side. The base was first washed with Burnt Sienna paint (Golden Fluid acrylics), a shade less saturated than the ink. Then, the rock parts were washed with Phthalo blue ink + matte medium (50/50) while the vegetation god Sap Green ink, the sponges Magenta ink, some little mussels with Dioxazene purple ink and the shelf coral 100% Burnt Sienna ink. This was all done fairly wet so some colors blended into each other. Highlights were applied when everything dried, using golden white and then white for some hotspots. Fine lines and small dots in thinned white were added all over the rocks for texture. For the crab, Washes of Turquoise ink + Phthalo blue ink + matte medium (40/10/50) were applied on the top of the carapace while the bottom got some light washes of the same mixture but with 90% medium and about 10% ink. The Chelae were washed with some additional blue ink. Highlights were applied using golden white with some pure white paint on hotspots. The eyes were the main feature and are just classic gem style using red paint with dark red shadows, orange highlights and a white hotspot highlight. The base was meant to be a shadowy sand bar, so it was painted all over first with golden white then allowed to dry fully. When dry, it was washed with Phthalo blue ink + matte medium (20/80) and allowed to dry. Then fine edge highlights were painted along the rand ridges with thinned white. Here is a combo shot with them both so you can see the size difference. Hi all, Here is one more step by step painting tutorial for the Sea Serpent for DeepWars, Blood Reef. This scaly creature is related to dragons so it has very heavy scales that work well with washes and glazes. Inks are Liquitex Pro inks and the Matte Medium is by Liquitex. Paints are Golden Fluid Acrylics. White and black are standard Americana brand craft paint. The first step was to paint the whole body in a light yellow shade over white primer, leaving only the mouth white. This was left to dry. Next, the body was given a wash of Pthalho Green ink, mixed with a touch of Sap Green ink, mixed with Matte Medium and water. The fins and mouth were washed with a Magenta ink, medium and water mix. The ratio of ink/medium/water was around 40/40/20. This was allowed to dry fully before the next step. Now comes the ugly step of shading down everything. The body, fins and mouth was washed with a mixture of Violet ink and a bit of black paint to darken it, and mixed with medium and water. The ratio was 20/30/50, so thin enough to go into all of the cracks but not so dark that it stained all of the green into oblivion. This was allowed to dry fully before moving onto highlighting. Finally, the step that makes everything pop out of the shadows again. The scales wee lightly drybrushed with wet layers of a mixture of Cerulean Blue ink, Sap Green ink and white paint. This was like a drybrush with a glaze, with the mixture at around 20/80, paint+ink to water. The key was to try to be subtle and give a bit more softness to the shading on the scales. The idea is not to paint completely over the green scales though or even to add a bright blueish highlight. After the glaze-drybrush, edges were painted in thinned white paint using the tip of a brush. This seems a bit tedious but is quicker than you may think since only the portion of the scale facing the light needs to be highlighted. Some scales on the neck behind the head needed a bit more highlight in the center, so a very thin glaze of thinned white was applied with the tip of the brush. The mouth was given washes of black to shade it more, then highlighted with thinned white, then glazed with Magenta ink. The tongue was shaded with Dioxazene purple ink, then highlighted with Magenta ink + white. fins were highlighted on the edges with white, then had some tiny white dots added for additional texture. The eyes were done with yellow over white, shaded with Burnt Sienna ink, then given a black slit pupil and hotspot reflection of pure white. To finish things off, the body was shaded with glazed of Deep Violet ink + black paint + medium and water (20/40/40) ratio of color, medium and water. adding the color more to the bottom of the body. An additional glaze of Pthalho Blue ink was applied to deepen the shadows. When these glazes dried, some scale edge highlights needed to be re-applied. The base was done with Raw Sienna ink first, then when dry, given a wash of Pthalho Blue ink + medium and water. Corals were glazed in Burnt Sienna ink and Violet ink. When all dry, it was drybrushed with a light golden sand paint. Thanks! The base actually comes with the mini. Hi folks, Here is an abbreviated step-by-step guide for the Dark Mariner Cephalid Ethermancer, a summoner of foul entities of the void. The model was painted with the glaze style, starting with a white primer coat. The first base layers were very light, doing using mainly thinned paint or inks. The carapace was painted with Golden Fluid Acrylics Indian Yellow mixed with some Reaper Golden highlight, as was the front trim of the robes and the eye on the hand. The tentacles were glazed with Cerulean Blue ink (all inks used are by Liquitex). The ethereal eruption coming from the side was glazed with Magenta Ink + a touch of Cerulean blue and white paint. The inner robes were glazed with Dioxazene Purple ink + white, while the metal belt and buckle were painted with Bronze ink. The "shirt" was painted with thinned English Ivy Green (Americana acrylics) while the sleeves were painted with a grayish mixture of blue, purple green and black paint. The hands were done with a thinned blue-gray mixture (Cerulean Blue ink, white & black paint). The crystals hanging from the belt were painted with Deep Turquoise Ink. Finally, the staff was painted with Reaper Golden Highlight and the top statue was glazed with Sap Green ink + black paint + white paint to make a bit of a jade appearance. The next step was to shade down everything. The blue tentacles were washed with Phthalo Blue ink mixed with some black paint. When dry, the tentacles on the face were glazed with a bit of Magenta ink under the faceplate. The "sprouting" tentacles were washed with Phthalo Blue ink, then when dry, with some Dioxazene Purple ink. The carapace was given a thick, gloppy wash of Burnt Sienna ink + Matte Medium, then when dry, it was washed with Phthalo Blue ink and Matte Medium. The goal was to have t pool in all of the recesses smoothly. The staff was washed with Burnt Umber ink, as was the golden trim of the robes in front. The robes were washed with thinned black paint + Burnt Umber ink. The eye on the hand was washed with Burnt Sienna ink to make a the orange rim. The Metal was washed with Burnt Sienna ink + Black paint. Now comes the long step. The washes and glazed needed to dry completely before starting the highlights. most highlights use opaque paint, or semi-opaque mixtures of paint and ink. The Carapace and front robe trim was highlighted with Reaper Golden Highlight + White paint, with final highlights of pure white on hotspots where the light would be striking from above. Some Sap Green ink was glazes on the patches of barnacles and algae on the carapace, then the edges of the barnacles were highlighted in white. The staff was drybrushed with Golden Highlight + white paint, then glazed down a bit with more Burnt Sienna ink and a bit of Sap Green here and there. Each blue tentacle was highlighted with white paint, mixed with a small amount of Magenta Ink. The tips of the blue tentacles also got a touch of Megenta to vary the color tone. To do the highlights, the tip of a small brush was used to paint lines along the tentacles, giving them more definition, then the suckers were highlighted. Small line reflections were painted from the tip to further back each tentacle also. The "sprouting" tentacles were highlighted with White paint + Megenta Ink, up to pure white, with some blending done with multiple layers of thinned paint. The inside of the mouths were glazed with dark red paint (red + black) to add contrast. The skin on the hands was highlighted with blue-gray paint + more white on edges. They eye was painted like a gem with lighter yellow + white paint on the bottom and darker orange-red on the top. A small vertical pupil was added, the a large reflection hotspot near the top with pure white paint. The robes were drybrushed with Golden Highlight + White paint, then glazed with Purple and Green ink to add some more color tone. Edge highlights on the robes were done with pure white to make them stand out. The metal was highlighted with a bit of silver + gold paint. The crystals took a bit of blending to complete, using Turquoise Ink mixed with white to make the gradients. Edges were painted in pure white. To show that they are glowing crystals, the area around them was drybrushed with some the the Turquoise/white mixture (staff, robes, trim, belt, arm, fingers). The statue on the staff, which was highlighted Sap Green + Gray + white, up to pure white. to finish it off, the Base was done with a quick method. The rocky parts (no coral) was given a wash of Pthalo Blue ink and allowed to dry. The coral was washed with Burnt Sienna Ink and allowed to dry. The rock and coral were drybrushed with Golden Highlight + White paint. When dry, the coral was glazed with a touch more Burnt Sienna ink while the rock was glazed with Sap Green, Burnt Umber and Dioxazene Purple inks. Some white dots were added as final highlights on the rock.